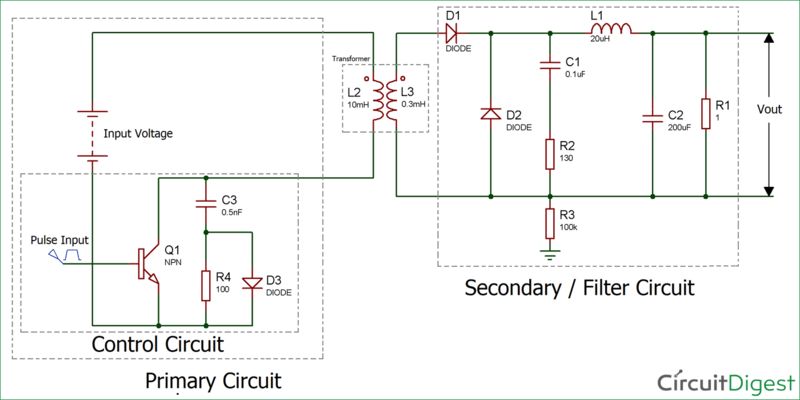 There are various circuits or methods available for building Switched Mode Power Supply (SMPS). SMPS is used for generating controlled and isolated DC voltage from unregulated DC power source. Forward converter circuit is similar to the fly-back converter circuit but it is more efficient than fly-back converter circuit. Forward converter is mainly used for the application which require higher power output (in range of 100 to 200 watts). Forward converter is basically a DC-to-DC Buck Converter with integration of transformer. If the transformer have multiple output windings you can even increase or decrease the output voltage. It also provides galvanic isolation for the load. Forward Converter Circuit consists of a control circuit which has a high speed switching device, a transformer whose primary side is connected to the control circuit and secondary side is connected to the filtering circuit. 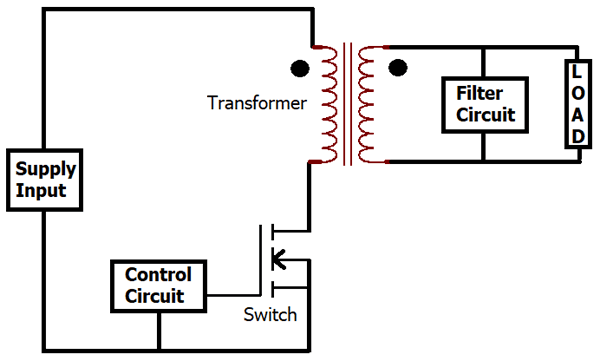 The rectified output from the transformers secondary winding is connected to the load. As per the above block diagram, when the switch is turned ON, the input is applied to the primary winding of the transformer and a voltage is appeared at the secondary winding of transformer. Therefore, the dot polarity of the windings of transformer is positive, due to this the diode D1 gets forward biased. Then the output voltage of the transformer is fed to the low pass filter circuit which is connected to the load. When switch is turned OFF, the current in the windings of transformer comes down to zero (assuming the transformer to be ideal). Forward converter’s switching frequency is in range of 100 kHz or more.